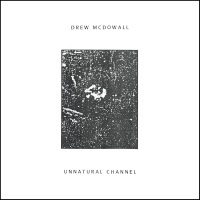 Unnatural Channel is Drew McDowall's follow up to his debut solo album Collapse released in 2015. Like Collapse, Unnatural Channel wallows in modular synths and abstract atmospheres but this time McDowall errs towards a more rhythmic sound melding elements of industrial and techno into his processed experimental work. In interviews Drew McDowall has spoken of his sleepless nights and I feel that may be the most obvious part of the Unnatural Channel referenced in the title. Unnatural Channel taps into the sense of disintegration first found on his debut but while it continues the themes Unnatural Channel evolves into a space distinct to Collapse. In relocating to New York Drew McDowall relinquished his place in the Coil line-up, a role that saw him contribute to Coil's Equinox work and the acclaimed volumes of Musick To Play In The Dark, as well as the Coil related projects Black Light District and of course Time Machines, which resulted from Drew McDowall's initial time-shifting experiments with tones and frequencies. It was a move made to secure his sanity but it seems his sleepless nights in New York have been productive musically finding himself within a conducive atmosphere of adventurous electronic musicians pushing industrial and electronic music into new and uncharted areas. Unnatural Channel does that too, taking Drew McDowall and his listeners into new territory, and especially within the mutated, morphed and processed rhythms he directs here. On the opener, 'Tell Me The Name', McDowall coaxes fragmented sounds of industrial clink and clatter over washes of deep reverberation. Snippets of voice melodies, processed and cut-up, emerge like alien chatter from the dense shifting slabs of electronics building up into an explosive relentless rhythmic throb. Post-Coil McDowall has become a master of slow evolving sound pieces, listen to 'The Chimeric Mesh Withdraws (Parts 1-3)' which spanned a whole side on his debut solo recording Collapse or anything from Compound Eye's Journey From Anywhere and you'll know what I mean but on Unnatural Channel it's really only the opener and the 2 part title track where Drew McDowall creates adequate space to permit the sound to unfurl and evolve, and when he does the results are staggering. Unnatural Channel is littered with a number of shorter tracks though with the emphasis on layers of processed and morphed rhythms. Entering with a shriek of horns 'Habitat' unleashes rhythms in the form of a barrage of repeated knocks, rings, and thuds over shifting reverberations and modulating synth tones. It seems to share an affinity albeit a distant one to the repetitive structure of 'Convulse' from Collapse. But while 'Convulse' featured the voice of Hiro Kone, 'Habitat' dispenses with vocals for volatile percussive clatter which is given a contemporary abstract industrial rendering. 'This Is What It's Like' slips into a deeper resonance with subsonic tones and shudders cut with noise claps. It is as if McDowall has stripped back and remodelled a techno track from its constituent parts. Wetware's Roxy Farman makes the first of her vocal contributions to Unnatural Channel murmuring "This is what it's like, sleep deprived". Edgy and restless it provides an audible mapping of the effects of sleep deprivation with an unpredictable interplay of thudding percussion and hammering rhythmic tones. 'This Is What It's Like' bustles with irregular beats that pound and shudder with an amorphous irritable quality creating turmoil and a sense of disquiet. There's more unease to be found on the whirring tones and drones of 'Unnatural Channel (Part 1)' which for the first few minutes offers a more unsettling take on the meditative drone sonics of Compound Eye, McDowall's previous project with Tres Warren of Psychic Ills. Here ripping flutters and quickened electronic tones pulse submerged in distorted textures extend into 'Part 2' giving way to an erratic assemblage of pounding tones, stuttered beats and ricocheting metallic clanks. Hammering away incessantly like a multitude of simultaneous headaches it eventually yields to wayward electronic sequences and crunching modular synth tones before disintegrating into a morass of tones and frequencies. Adrift in a haze of quivering noise textures and queasy Coil-like Black Light District sidereal abstractions, 'Recognition' is more dense and complex, avoiding anything approaching clarity for a full-blown hallucinogenic episode but it's nothing when compared to 'Unshielded' the final piece on Unnatural Channel which approaches a state of circling mania, with Roxy Farman in a state of near hyperventilation; her compressed vocal reduced to a shivering timbre over careering processed and shifting discordanct tones.